The Kronnerburger on Challah Bun with white cheddar sauce. Kronnerburger is a pop-up burger place in the old Bruno's bar on Mission Street in San Francisco. There is actually no sign on the door, but they do have a temporary sign at the door when Kronnerburger is open from 6-late. We arrived right after they opened and had the place all to ourselves. The old bar is very dark and cozy. Edgy rock music, tastefully curated, played loudly. We were greeted cheerfully and shown to our table. We ordered up and almost immediately received the best poutine I have ever had. Maybe ordering poutine is cheating on fries, but I have fallen in love with it recently. 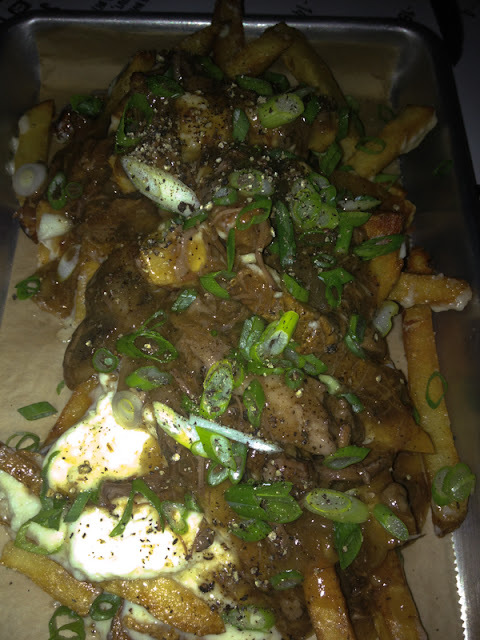 The version here called "Fries with Beefcheek gravy and cheese curd" was $10. You can add bone marrow for $4 more. I could not stop eating the crispy fries with the luscious gravy and soft melted curds. Amazing. The poutine tastes a lot better than this photo would indicate. 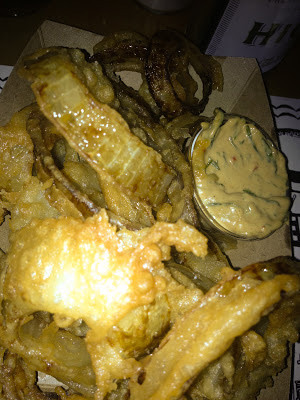 We also got onion rings ($6) that audibly crunched when you bit them. Battered lightly and sliced thin, they held up well to the spicy chili aioli that accompanied them. I think this is the best fries/onion rings combo I have ever had. The burger came. Billed as rare and salty, it did not disappoint on either count. 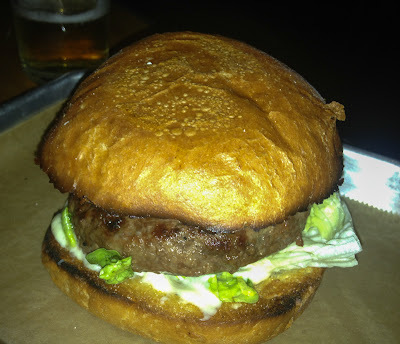 The challah bun was heavily toasted and fit perfectly to a somewhat modestly sized burger. I would guess 6 ounces or so. The white cheddar mayo sauce was sloppy and tasty, holding its own to the salty beef patty. The red onions were sweet and nicely grilled. Crispy pickle slices and crisp lettuce rounded out a very nice burger. Just to finish with aplomb, we ordered the ice cream burger ($6), chocolate ice cream sandwiched between two very thin chocolate chip cookies. I liked this better than others of this ilk. Usually the cookies are too thick and overwhelm the ice cream. This has just the right balance between cookie and ice cream. Ice Cream burger finishes off a great repast. The place is very dark, so my photos here don't do the food justice. You will have to go and experience for yourself! 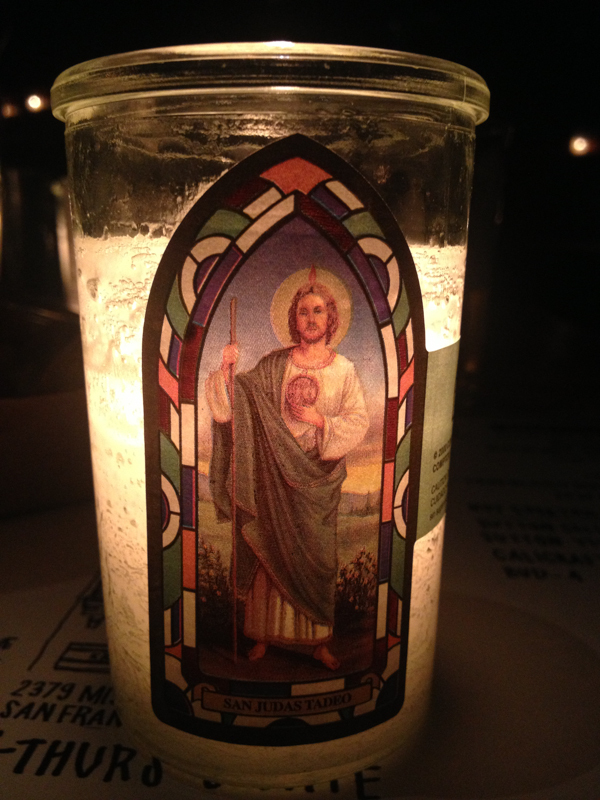 Jesus provides the only light at the table.